Tom Brown (roasted-maize porridge) is one of the traditional weaning foods in Ghana. As an effort by the Ministry of Health to enhance the nutrient content of this low-nutrient-density weaning food, a product called weanimix, which is Tom Brown fortified with legumes (cowpeas or soybeans and groundnuts), was introduced more than two decades ago. Cowpeas are an indigenous African legume, popularly used by Ghanaians for various traditional dishes. While soybeans are not traditionally used, they can easily be incorporated into local diets. Commercial weanimix-type products in ready-to-cook flour form are currently available mainly at supermarkets, which target higher-income consumers. 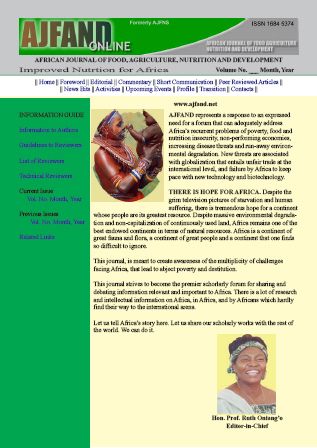 This paper examined: (1) the competitiveness between cowpeas and soybeans as an ingredient in weanimix; and (2) constraints to making weanimix more widely available to lower-income families. Local food processors, weaning mothers, commercial custom millers, and retailers were interviewed for both qualitative and quantitative data. Secondary price data were collected from different sources including the Ministry of Food and Agriculture. Descriptive analysis was carried out to address non-price factors of the issues, and enterprise budgeting and sensitivity analyses were conducted to address price factors. The study found that the higher price of cowpeas, compared to soybeans, is a minor factor in local processors' choice between cowpeas and soybeans. Rather, the current overwhelmingly popular use of soybeans in the weanimix-type products among the respondents was attributed to non-price factors such as the perception that soybeans are more nutritious. A main reason for the lack of availability of weanimix for mothers from lower-income families appeared to be low awareness of the product among consumers. The results of sensitivity analysis showed that typical differences in prices currently observed between weanimix-type products and Tom Brown seems to be larger than the difference in the cost of production between these products. It was also shown that the level of processing and retail margins greatly affect the retail prices of weanimix. weanimix could be made more available to lower-income consumers if local companies expanded their outlet for the product from supermarkets to small shops or if grain and flour-type product vendors in the local markets (who currently prepare and sell Tom Brown) produced and sold weanimix. However, actions would need to be taken to help assure consumers of the quality of the product sold through market vendors.